An introduction to the series (K.J. Hsü). Dedication to W.A. Van Den Bold (P.P. McLaughlin Jr., B. Sen Gupta). Preface to the volume (P. Mann). List of contributors. Part A: Tectonic Setting of Caribbean Basins. Caribbean sedimentary basins: classification and tectonic setting from Jurassic to present (P. Mann). New constraints on the late cretaceous/tertiary plate tectonic evolution of the Caribbean (R.D. Müller et al.). Part B: Jurassic-Recent Basins of the Northern Caribbean, The Gulf of Mexico, and Mexico Related to Rifting Between North and South America. Jurassic-early Cretaceous tectono-paleogeographic evolution of the Southeastern Gulf of Mexico (G.L. Marton, R.T. Buffler). The exposed passive margin of North America in Western Cuba (A. Pszczólkowski). Stratigraphic evidence for northwest to southeast tectonic transport of Jurassic terranes in Central Mexico and the Caribbean (Western Cuba) (E.A. Pessagno Jr. et al.). Cretaceous carbonate biostratigraphy and environments in Honduras (R.W. Scott, R.C. Finch). The structural evolution of the Southern Great Bahama Bank, Southern Bahamas (J.L. Masaferro, G.P. Eberli). Part C: Cenozoic Basins of the Northern Caribbean Related to Arc, Collisional and Strike-Slip Activity. Deformational history of Roatan Island: implications for the origin of the Tela Basin (H.G. Avé Lallemant, M.B. Gordon). The southern flank of the Tela Basin, Republic of Honduras (W.I. Manton, R.S. Manton). Cretaceous microfaunas of the Blue Mountains, Jamaica, and of the northern and central basement complexes of Hispaniola (H. Montgomery, E.A. Pessagno Jr.). Cenozoic El Mamey Belt of Northern Hispaniola: a sedimentary record of subduction, collisional, and strike-slip events within the North America-Caribbean plate boundary zone (R. de Zoeten, P. Mann). Tectonic and eustatic controls on Neogene clastic and evaporitic deposition in the Enriquillo Basin, Dominican Republic (P. Mann et al.). Evolution of the Neogene Kingshill basin of St. Croix, US Virgin Islands (I. Gill et al.). Part D: Cenozoic Basins of the Eastern Caribbean and Lesser Antilles Arc System. Review of the tectonic controls and sedimentary patterns in late Neogene piggyback basins on the Barbados Ridge complex (P. Huyghe et al.). Tectonic evolution of the Grenada basin (D.E. Bird et al.). Part E: Jurassic-Recent Basins of the Southern Caribbean. Sequence stratigraphy of the Eastern Venezuelan basin (J. Di Croce et al.). Structure of the Gulf of Paria pull-apart basin (Eastern Venezuela-Trinidad) (J.F. Flinch et al.). Structural and sedimentary development of a Neogene transpressional plate boundary between the Caribbean and South America plates in Trinidad and the Gulf of Paria (S.E. Babb, P. Mann). Part F: Mesozoic-Recent Igneous Basement and Overlying Basins of the Central Caribbean. New insights on the formation of the Caribbean basalt province revealed by multichannel seismic images of volcanic structures in the Venezuelan Basin (J. Diebold, N. Driscoll). Tectonic and stratigraphic development of the Eastern Caribbean: new constraints from multichannel seismic data (N. Driscoll, J. Diebold). Neogene intraplate deformation of the Caribbean plate at the Beata Ridge (A. Mauffret, S. Leroy). 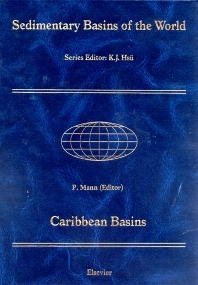 This 21-chapter volume provides a regionally-comprehensive collection of original studies of Caribbean basins conducted by academic and petroleum geologists and geophysicists in the early and mid-1990s. The common tectonic events discussed in the volume including the rifting and passive margin history of North and South America that led to the formation of the Caribbean region; the entry of an exotic, Pacific-derived Great Arc of the Caribbean at the leading edge of the Caribbean oceanic plateau; the terminal collision of the arc and plateau with the passive margins fringing North and South America; and subsequent strike-slip and accretionary tectonics that affected the arc-continent collision zone. Two introductory chapters (Part A) utilize recent advances in quantitative plate tectonic modeling and satellite-based gravity measurements to place the main phases of Caribbean basin formation into a global plate tectonic framework. Nineteen subsequent chapters are organized geographically and focus on individual or groups of genetically-linked basins. Part B consists of five chapters which mainly focus on basins overlying the North America plate in the Gulf of Mexico, Cuba and the Bahamas that record its rifting from South America in late Jurassic to Cretaceous time. Part C has six chapters that focus on smaller, usually heavily faulted and onshore Cenozoic basins of the northern Caribbean that formed in response to arc collisional and strike-slip activity along the evolving North America-Caribbean plate boundary. The two chapters in Part D focus on Cenozoic basins related to the Lesser Antilles arc system of the eastern Caribbean. Part E is comprised of three chapters on the Jurassic-Recent sedimentary basins of the eastern Venezuela and Trinidad area of the southeastern Caribbean. These basins reflect both the Jurassic-Cretaceous rifting and passive margin history of separation between the North and South America plates as well as a much younger phase of Oligocene to recent transpression between the eastward migrating Lesser Antilles arc and accretionary wedge and the South America continent. The three chapters of Part F contain deep penetration seismic reflection and other geophysical data on the largely submarine Cretaceous Caribbean oceanic plateau that forms the nucleus of the present-day Caribbean plate. For researchers, oil and mining companies, libraries, academics, petroleum geologists, geophysicists and graduate students interested in the Caribbean region, basins and arc processes.